Dunnville Horticultural Society (DHS) —-Active in our Community! Gardeners are generous, and DHS members are no exception.We held our free seed exchange at our February program with 77 in attendance. Members had lovingly gathered, dried and packaged their seeds, noting color, size and often instructions. They were eager to share their bounty. Thank you to Beth Powell who provided information to anyone with questions. Guest speaker Hannah Jacobs from “Matchbox Seed Company” provided insight on Heirloom seeds, open pollination and veggie boxes. March’s program with 63 in attendance, enjoyed a presentation by Karen Bushert from Grand River Conservation Authority on “Bees and Pollination”. Earlier in the day, Karen met with DHS President Debbie Thomas and Vice President Deb Zynomirski at Centennial Park to exchange ideas, techniques for planting, and plant selection for the rehabilitation of the butterfly gardens located in front of Muddy. The rehabilitated butterfly gardens will be part of the complete restoration of Centennial Park along with the fountain, Muddy repairs and the pathways reworked. This by far is the largest project DHS has taken on, and fundraising is ongoing. 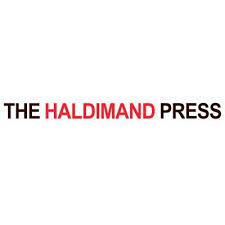 DHS has partnered with Haldimand County, and Dunnville Christian School, and is grateful for their participation. Donations from individuals and groups are welcome and tax receipts will be issued (min. $25.00). DHS would like to invite you to drop by Centennial Park, Saturday April 29th between 11am-1pm to preview the ongoing park improvements, with an opportunity to chat with DHS members who will be working in the butterfly gardens, along with the children from Dunnville Christian School, and Mike Walker (Muddy’s creator). 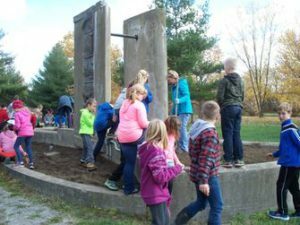 Dunnville Silo will be completing the restoration of the fountain uprights. Upgrades will continue throughout spring and summer with the Rededication Ceremony scheduled for September 23rd. DHS invites you to join their next program on Thursday April 20th at 7pm. Doors open 6:30pm with guest speaker Jeff, from Jeff’s Lawn Care Inc., Binbrook on “Growing a Healthy Lawn”. For more information, please visit our new website www.dunnvillehortandgardenclub.org or contact President Debbie Thomas (905) 774-3064. Programs are free and open to everyone! DHS feels honoured and excited that Christian Corbet has agreed to be a part of its biggest project ever, the restoration of Centennial Park Fountain. 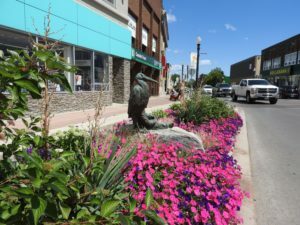 Christian Corbet will come to Dunnville for two weeks in mid-May to restore Holbrook’s original work on the fountain to pristine condition. “It was probably the most monumental of them all,” said Christian of Holbrook’s sculpture work on the Dunnville fountain. “He was very excited to hear of our project and to be a part of it,” said Debbie Thomas. Christian hopes to not only restore Holbrook’s work to its original pristine, but also hopes to educate and inform the community on Holbrook’s legacy and on the discipline of sculpture in Canada. Holbrook was Canada’s leading woman in portrait sculpture at the time. She was the crème de la crème in portrait sculptors in Canada and she sculpted everyone from Einstein to Churchill to Roosevelt. Chrisitan Corbet was the only person she took under her wing. they don’t have the labelling program in full use yet. plants too Sheridan nurseries says it is majority free but no guarantees due to the far range of suppliers from US,Europe and Canada. Can. Tire and Loblaws are working on elimination also. This is good news for gardeners. Raised bed gardening is a great way to grow vegetables especially if the garden soil is poor, compacted or has poor drainage. They also are practical where space is very limited. It’s amazing what can be grown in a 4′ x 8′ area. And there’s no bending over to pull weeds or harvest vegetables! The following advantages compensate for those who have had to downsize their living or who may not have adequate space and sufficient sunlight for traditional gardening. 1. They take very little space and can even be built over a concrete patio but don’t build on your deck! 2. Drainage is superior; 12″ deep usually provides ample depth for most vegetable roots. 3. Various items can be used to fill the bed such as manure, wood chips, leaves, compost and bagged soil. 4. The soil in raised beds warms up more quickly in spring. 5. If the bed is narrow, there’s no need to step into the garden. 6. Sides may be made of wood, stones, brick, cinderblocks, sand bags or other natural materials. Consider using ash logs or defective or used concrete blocks. 7. To prevent deterioration of wood, it can be charred or covered with plastic. Wire netting on the bottom can also be installed to deter rodents. 8. Choose a location which will receive at least six hours of sun daily. 9. Due to its limited size, sow seeds close together . This prevents weeds, maximizes sun, conserves water and fertilizer. Consider growing beets, carrots or radishes in a row 10 – 12 inches wide and much shorter than usual. 10. As shown in the photo, multiple crops can be grown. 11. Depending on the materials and design, a raised bed can also be very aesthetic. “The first day of spring is one thing, and the first spring day is another. The difference between them is sometimes as great as a month.” -Henry Van Dyke. Start seeds indoors. We are about 6-8 weeks away from ‘planting out’ season. There are many vegetables and flowers that can be started indoors from seed this time of year. This is as satisfying as it is money saving. Peruse the seed racks at your local retailer. You will find a wide variety of seeds. Growing your own plants is fun and cheaper than purchasing pre-started plants in May. Try veggies such as tomatoes, peppers, onions, broccoli, and cauliflower. Some good flower choices include petunias, zinnias, marigolds, snapdragons and impatiens. Prepare for starting seeds indoors by gathering supplies and equipment. The most crucial element for successful seed starting begins with quality and fresh seed. Each year as seed ages, its germination diminishes as well as the quality of the young plant. Using sterile soil, supplemental light, and bottom heat of about 70 degrees F are the other crucial elements. 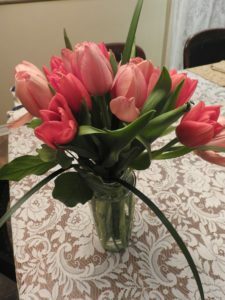 March is a good time to start dahlia bulbs and canna bulbs indoors. Use one gallon sized pots, filled with a good potting soil. If it is raining or too cold to go outside and work this is the perfect time to pot up dahlia and cannas in pots. Place the pots in a sunny window or heated greenhouse and water. When the snow has melted, cut back the standing perennials in your flowerbeds such as sedum, rudbeckia, shasta daisies and the like. Most of them break off at the base and are easy to clean up. Empty nesting boxes anticipating the arrival of migratory birds. Some tree swallows will arrive early April. Clean bird bath and feeders to welcome spring feathered friends. Visit your favourite nursery or garden centre and bring home a pot or fresh bouquet of spring flowers like tulips, daffodils or crocus. Start planning for a very special Easter or Passover with your family and friends. April will be here before we know it. Put your feet up! A great website is waiting for you. Visit www.dunnvillehortandgardenclub.org. Look at our ‘Events’ drop-down listing for more spring gardening activities. 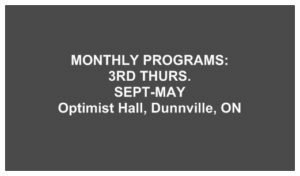 Be sure to join us from 7-9pm, March 16, for our DHS monthly program night, at the Optimist Club Hall, 101 Main St., Dunnville. Karen Bushert & Moritz Sanio from the Grand River Conservation Foundation will present “Trees and Bees”. There will be refreshments and free recycled garden give-aways. This evening is free and open to everyone, members and non-members alike. We are a welcoming group of people of all ages and gardening stages. If you have questions or for more information call Debbie Thomas, Dunnvillle Horticulture Society/Garden Club President (905) 774-3064 or Deb Zynomirski, VP (416) 556-9337.